Cookies, cookies, cookies! They are our favorite! So here, yet again, is another spectacular cookie recipe. This is the best, most simple peanut butter cookie recipe. But you get to insert some of your creativity and personality into it. First, are you going to use creamy or chunky peanut butter? Will you go with chocolate chips or no chips? Will they be semi sweet or milk chocolate? What about using peanut butter chips? Or both!! Yes, I know, I am blowing your mind right now. But play with it, see what you and your family like. 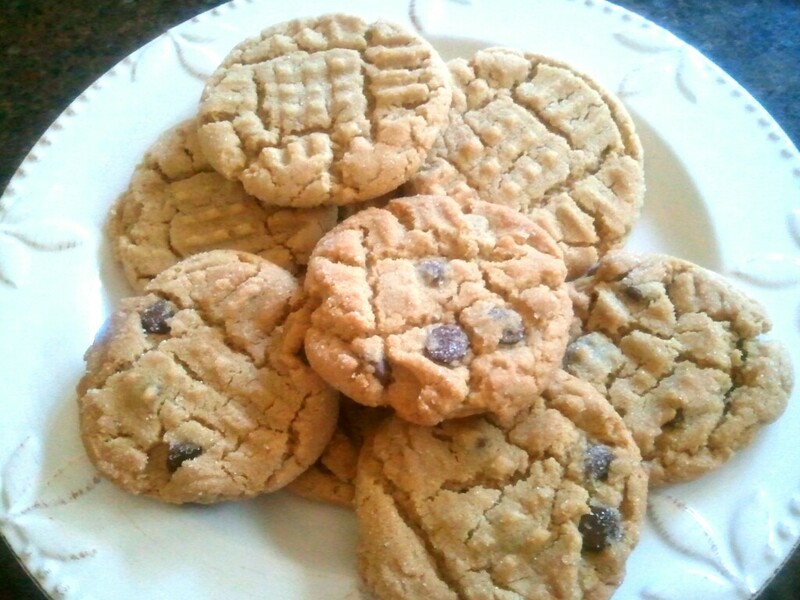 My favorite is creamy peanut butter with milk chocolate chips. But the hubby is in love with chunky peanut butter with peanut butter chips. Can you say dilemma?? I will leave it to you and yours to battle over what you think is the best. Have fun! 1 c. sugar + 1/4 c.
Cream together butter, peanut butter, sugar and brown sugar. Then add eggs and vanilla. Mix until combined. Add salt and baking soda. Then add the flour one cup at a time until combined. Put 1/4 c. sugar in a shallow bowl or plate. Using a medium cookie scoop, scoop dough into ball and roll around in sugar. Place balls on cookie sheet. Then press each ball with a fork in a criss-cross manner. Bake for 10-12 minutes. Cool on a wire rack. I like the valuable info you provide in your posts. I ll bookmark your weblog and check again here regularly. I m quite sure I ll learn many new stuff right here! Good luck for the next!